How do some sentences trick us into thinking they're good, when really they're not? And what can that tell us about how we process language? In this episode, we take a look at the comparative illusion, a tricky kind of sentence that seems meaningful, but falls apart when we consider it further. And then we look at what exactly it is about them that confuses our minds. The comparative sentences that we talked about in our episode on grammatical illusions, like in (1) below, are surprising because of how far away people’s first impressions tend to sit from reality. (1) More people have been to Montreal than you have. When you give it a moment’s thought, it becomes clear there’s a sizeable gap between how sensible it seems at first glance, and how little information it actually communicates. But we still manage to interpret these sentences, in a way that fits the machinery made available by our mental grammar. As we discussed in the episode, the fact that we’re also able to count how many times something happened, in addition to how many there are of something, gives us a kind of half-working backdoor into understanding them. But, there’s another kind of illusion that’s even more striking, where there really isn’t any way at all to make sense of it. Try reading the following sentence aloud. It seems pretty run-of-the-mill, pretty boring … except when you try to work out who’s doing what to who! It’s clear enough that the patient met Jack, and that the clinic’s doing some hiring, but what’s that nurse doing in the sentence? What’s his or her relationship with the patient? Or Jack? The nurse is just kind of … floating there, not really doing anything at all! To make what’s going wrong more obvious, have a look at the simplified structure below. Each clause, whether it’s the overall sentence or an embedded one, has to have one subject noun phrase and one predicate verb phrase. Three clauses means three of each, but plainly, one of the verbs is simply missing in action! 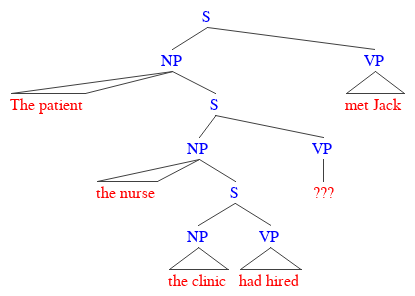 This problem becomes unavoidable when we trim our tree and take out that lowest clause, giving us “The patient the nurse met Jack,” which really can’t mean much of anything. In fact, it’s a violation of a basic condition on the shape that sentences can take, known as the Theta Criterion, which essentially demands that verbs and their subjects have to match up one-to-one. Sentences like the one in (3), then, end up forming a class of grammatical illusions that result from the so-called missing-VP effect. And as remarkable as they might seem already, things get even stranger when we consider their supposedly grammatical counterparts. Take the modified version below, with the missing VP put back in its place. While everything’s where it should be, the sentence has now become just about impossible to follow — or, at least, a lot harder to understand on a first pass than the simplified version in (7), where the lowest clause has once again been pruned from the tree. This difficulty with understanding an otherwise perfectly grammatical sentence — at least, according to the rules we know about — is thanks to a phenomenon that’s been pondered over since at least the 1960s: centre embedding. While placing one clause right in the middle of another works fine once, as in (7), applying the same rule a second time over produces an incomprehensible mess, like in (6) above or (8) below. Even though we can diagram these sentences out and force ourselves to follow the plot from one branch to the next with a whole lot of effort, they don’t really sit well when we hear them out loud. And this seems to suggest an upper limit on how many times our rules can apply. Except, we can find cases where this upper limit goes right out the window, like this 3-clause deep sentence! With a quantifying expression and a pronoun in place of two more definite noun phrases, everything seems to be back in working order. And even more complex sentences than this can be found in writing, though they’re fairly rare. So, what’s going on here? And how can we account for all this seemingly contradictory data? To start, it’s worth considering one of the most cited papers in all of psychology, The Magical Number Seven, Plus or Minus Two by George A. Miller. This work became famous not for putting an upper limit on how many times some rule or other could apply, but on how much information we’re able to hold in working memory. Like the title says, there seems to be a fairly low ceiling on how many ‘bits’ or ‘chunks’ we can actively hold in our heads at any given time. And this applies to processing language as much as anything else. In fact, in a pair of papers co-written with linguist Noam Chomsky the following decade, Miller hypothesized that our trouble with centre embedding has more to do with limitations on our memory than on our grammar — which could account for why fiddling with the details (e.g. swapping certain kinds of nouns for others) can sometimes get around the problem. But then, what exactly is going wrong in the sentence in (6), and more importantly, why should something meaningless like (3) get a free pass? Well, research into how we handle these sentences is very much active, but at least one recent theory takes some steps towards shedding a little light on the contrast. As we encounter each new noun phrase in a sentence like (3), an expectation is set up that we’ll reach the end of that clause; in other words, we anticipate that we’ll encounter a matching verb phrase for each one. But something starts going wrong when we get to the lowest, most deeply embedded part of the sentence (i.e., “the clinic”). When we hear that first verb phrase “had hired,” it slots into the lowest open position pretty easily, because that lowest and most recently encountered clause is the current focus of our attention. But when we encounter that second verb phrase, “met Jack,” we’re left at a disadvantage: we’ve got two more open positions to fill, but each one completes a clause that’s been interrupted by another one, having had the focus of attention wrenched away from it. What’s worse, all the clauses are syntactically identical, with nothing to differentiate between them. And, so, the little working memory we have is overloaded. We default to connecting that second verb phrase to the first, highest clause, and mistakenly assume we’ve finished building the sentence. This Interference Account supposes that the two remaining incomplete clauses that were interrupted by an intervening relative clause compete and interfere with each other, overwhelming our limited memory and forcing us into making the wrong choice. It also explains why we have so much difficulty with centre embedding more generally: since we default to connecting that second verb phrase up to the highest clause, believing we’ve completed the sentence as a whole, encountering a third verb phrase in a sentence like (6) or (8) completely violates our expectations, and throws us for a loop. So, the existence of acceptable nonsense like (3) and of well-formed but incomprehensible sentences like (6) doesn’t mean that our grammar is broken beyond repair; it just means that the rules that make up language are owned and operated by less-than-perfect users! So how about it? What do you all think? Let us know below, and we’ll be happy to talk with you about the linguistic illusions our mind can trick us into believing. There’s a lot of interesting stuff to say, and we want to hear what interests you! Bound to be Free Coming soon!